Kodi UK Turk Playlists Add-on: What is it and should you install it? We take a look at the hugely popular Kodi UK Turk Playlist Add-on, including what it does, if it is worth installing, if it is safe to use and what alternatives exit. If you’re interested in setting up a home theater system, Kodi is one of the easiest ways to do it. It’s free, open source, and best of all can be installed on a huge range of devices. Whether you’re using a simple USB stick, Windows or Mac PC, Amazon Fire TV, Roku, Raspberry Pi, iPhone, or Apple TV, you can install Kodi and be watching your favorite content in minutes. There are two ways to achieve this. Kodi allows you to access audio or video content that’s saved on your device’s internal storage, but transferring lots of content to a mobile device can be cumbersome at best. You also have the option to install extra software packages called add-ons. These gather links to content that’s hosted online and generally offer far more content than could be saved locally. 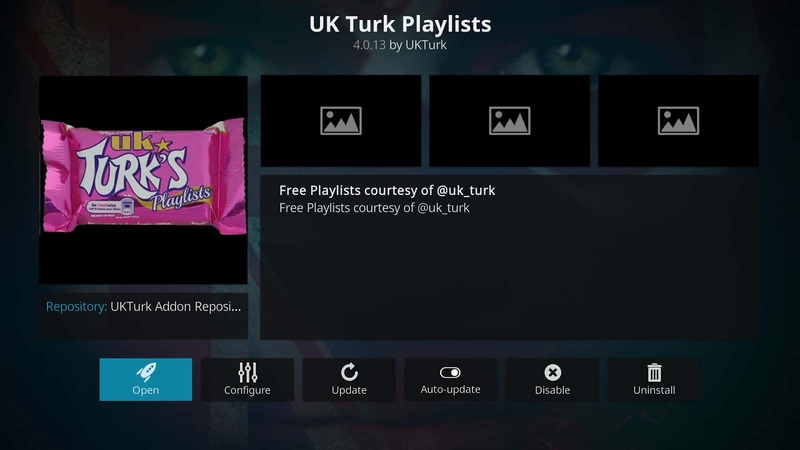 One of Kodi’s most popular third-party add-ons is named UK Turk Playlists (sometimes called UK Turks Playlist). In this article, we’ll be explaining what UK Turk Playlists is and how it functions. We’ll also be covering some of the privacy and security issues that all Kodi add-ons share, whether they’re official or third-party. Kodi is perfectly legal to use, however certain add-ons have sullied its reputation by providing access to unlicensed content. Copyright law is confusing at the best of times, and the laws differ from one location to another. Given the increased attention Kodi users have been receiving, it’s more important than ever before that you research the laws in your country regarding streaming content online. In recent years virtual private networks (VPN) have become something of a hot topic. Governments all across the globe are increasing the strength of their surveillance powers with the justification that if you have nothing to hide, you have nothing to fear. However, in today’s always-connected world, there are many completely legitimate reasons a person might use a VPN, especially if they’re a Kodi user. Take security, for example. Every piece of software in the world can be hijacked given enough time, and Kodi add-ons are no exception. While official add-ons tend to be created with stringent security and validation processes in place, third-party add-ons have neither of these and are considered higher risk. Once an add-on has been compromised, an attacker can more or less do whatever they want with your computer, from stealing passwords to monitoring your activities with a Man-in-the-Middle (MitM) attack. There’s a good chance that your own internet service provider (ISP) is far from impartial too. They can sell your browsing history, stop you from visiting certain websites, and even reduce your browsing speeds to discourage streaming videos online. This applies regardless of how much money you’re paying and whether you’re watching officially licensed content or not. However, there is a way to protect yourself from these threats. When you use a VPN, all incoming and outgoing traffic is encrypted, making it useless to anyone examining your online activity. Unless the observer works for a government agency, decrypting this traffic would take thousands of years. One of the best VPNs for Kodi is named IPVanish. Unlike most of their competitors, IPVanish build and maintain their own infrastructure which allows them to provide their users with the highest possible speeds. This VPN works with every add-on we’ve ever tested too, and it can also be installed on a huge range of devices including Amazon Firestick so you can remain protected no matter where you are. Further, IPVanish don’t keep any logs of your traffic. This means that if they are asked about your activities, they are unable to tell anyone anything about your browsing and streaming habits. If your ISP doesn’t know what you’re doing, they won’t automatically throttle your internet speeds, so a VPN could actually prevent buffering and improve your Kodi experience. What is the Kodi UK Turks Playlist add-on? UK Turk Playlists is a third-party Kodi add-on that offers both live TV channels and on-demand content. This add-on is what’s known as a link scraper: it gathers links from various streaming websites and aggregates them in one place for easier access. This add-on’s media library is far more organized than that of its rivals. However, the vast majority of it is unlicensed. There is no way to view the list of content providers, so you cannot add any of your own, or turn off those which host unlicensed content. To its credit, there is a dedicated section for pre-1950’s films. These are more likely to be in the public domain. However, there is no definitive list of all such titles and as such, not all content in this section can be confirmed to be licensed. Curiously, this section contains some media from the 1950’s, such as 1959’s Attack of the Giant Leeches (which is public domain), so it may be less organized than it appears. The developers of the Kodi UK Turks Playlist do not have a dedicated website or Facebook profile. Their only social media presence is on Twitter, but their tweets are protected and you have to submit a follow request in order to view them. Since most forums do not allow their members to discuss third-party add-ons, if this add-on were to be hijacked and you couldn’t view the official Twitter, there’s a good chance you wouldn’t know until your system was already compromised. For the reasons above, we do not recommend that Kodi users install or stream content with UK Turk Playlists. Kodi users looking to stream officially licensed content with UK Turks Playlist face a tiresome process of checking whether each individual title is in the public domain or not. There are several other add-ons which remove any doubt by only hosting legitimate content, whether it be movies, TV shows, or music. 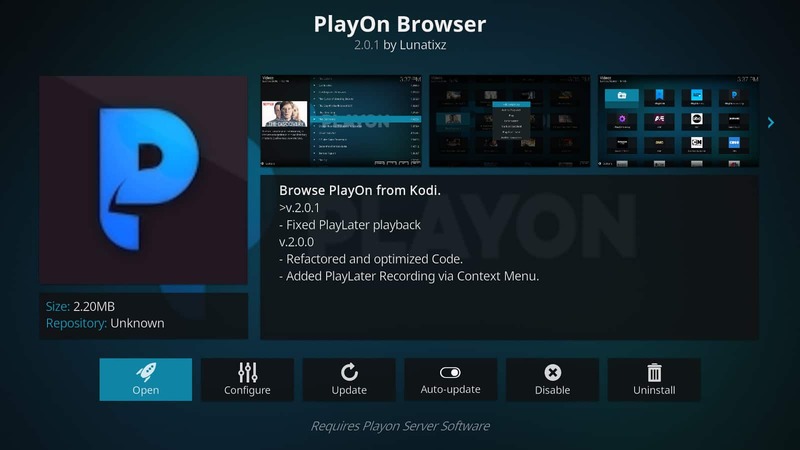 PlayOn is one of the best ways to amalgamate content from several different streaming platforms into Kodi. You will need a PlayOn subscription ($2.50 per month), plus one for each service you’d like to use. This is still likely to cost less than a cable TV package. If it doesn’t live up to your expectations, you can take advantage of PlayOn’s 30-day money back policy, so there’s really nothing to lose by trying it out. PlayOn does more than just deliver content, though. It also allows you to automatically skip ads and record media straight to your Windows PC. The recordings are saved in .MP4 format, so they’re highly portable after the fact and can be watched on almost any semi-recent device. 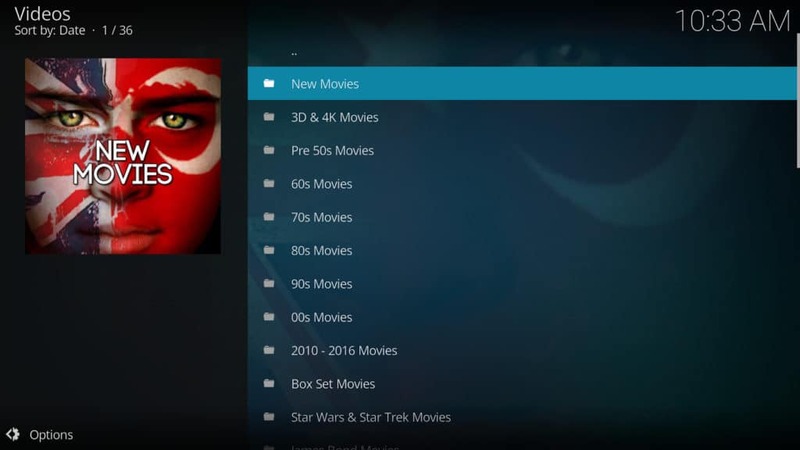 The PlayOn Kodi add-on Kodi can be found in the official Kodi add-on repository. FilmOn.TV is a service which allows its users to access live TV and radio channels from all around the world. All of the streams on offer are completely legitimate.Although some of them require a FilmOn subscription there are dozens which don’t. While this add-on provides streams from multiple countries, it’s never difficult to find the content that you’re looking for. Its list of streams are organized by their country of origin and also by genre so you can quickly find a channel broadcasting in your native language. Every taste is accounted for: FilmOn offers everything from political news to vintage horror, and even has a small selection of on-demand content for when you can’t find anything you want to watch live. 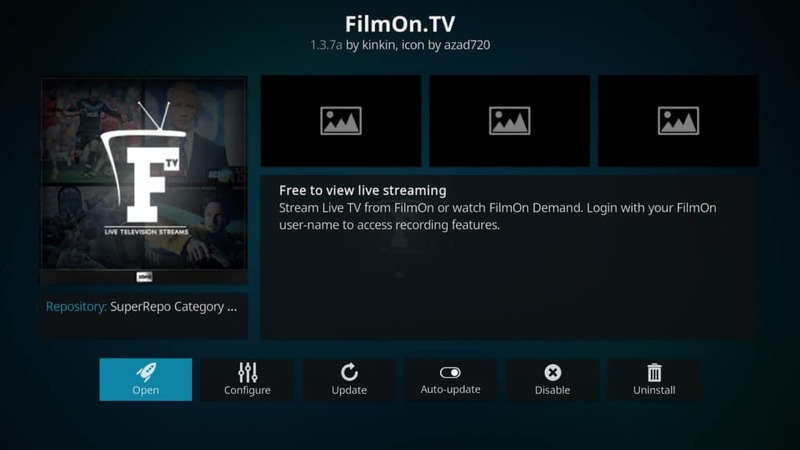 The FilmOn.TV add-on for Kodi can be found in the SuperRepo Category Video repository. SoundCloud is a platform that allows its users to share their own original audio. It’s one of the best places to find new and upcoming artists, and thanks to its add-on, you can access its extensive library directly through Kodi. This add-on gives you the choice of listening to whatever is trending and lets you search for content by genre. Thanks to an agreement with multiple record companies, SoundCloud users can now upload their own remixes of licensed content. You can even listen to songs that you already know, albeit with a new twist. It’s not just music; there are also podcasts, audiobooks, and news segments available. This makes SoundCloud a strong choice for any Kodi user looking for a versatile, reliable, and most importantly, legal audio add-on. 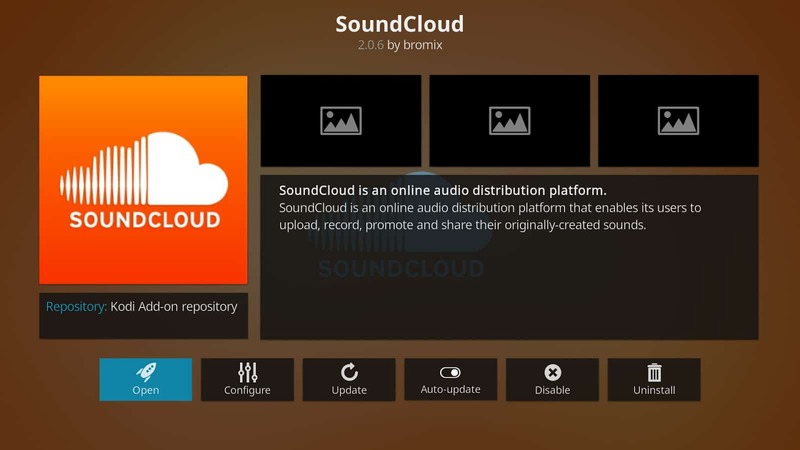 The Kodi SoundCloud add-on can be found in the official Kodi add-on repository. Reddit is one of the world’s most popular websites and as a result has a constant flow of new content being shared. Unsurprisingly, there is an add-on named Reddit Viewer that allows you to browse Reddit directly through Kodi. This add-on comes preconfigured with some of the biggest video-based subreddits already added, but you can quickly and easily add your own too. It’s also possible to add users to this list, showing all threads that they’ve contributed to. The Reddit Viewer has some fairly in-depth options. There are filters that allow you to hide posts based on their content type, maturity rating, or the subreddit they come from. 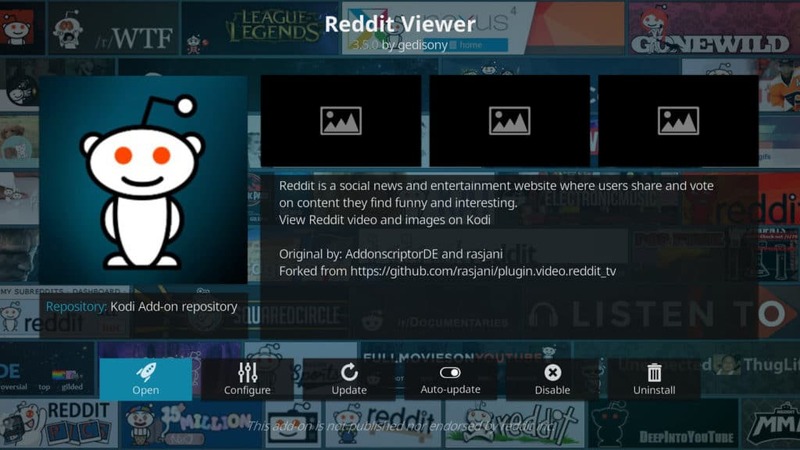 This allows you to create a truly customized view of Reddit which is easily navigated, even when using a TV’s remote control. The Kodi Reddit Viewer add-on can be found in the official Kodi add-on repository. The Kodi UK Turks Playlist add-on offers little to users looking for legitimate sources of content. It muddies its own waters by including potentially unlicensed post-1950’s content in one of the only categories that includes public domain titles. As this is a third-party add-on, it is at greater risk of hijacking than an official one, and considering that the developers have restricted access to their social media account, there is no way of knowing if the add-on has been hijacked without trusting potentially unreliable sources. When you consider that there are official sources available for almost any kind of content–many of them free to access– the Kodi UK Turks add-on loses much of its luster. With the increased risk this add-on offers, we feel Kodi users would be better served by an officially licensed alternative.